This short ribs recipe is so rich and delicious, no one will know you weren't slaving over a hot stove for hours. Using a slow cooker is a great way to save some time for holiday prep. This short ribs recipe is so rich and delicious, no one will know you weren’t slaving over a hot stove for hours. A few notes: The recipe can easily be doubled or tripled for a larger crowd. Try not to skip the step of browning the meat and veggies before putting into your slow cooker. It will add depth to the meat and vegetables and the overall richness of the sauce. But if you are really pressed for time, just throw it all in there. The pomegranate molasses adds a traditional, sweet flavor perfect for the New Year. For an extra festive presentation, garnish the short ribs with colorful pomegranate arils (seeds) and fresh parsley or mint (or both!). Mix together the cinnamon, coriander, paprika, red pepper flakes, salt and pepper in a small bowl. Place the short ribs on a large plate and rub the spice mix all over the ribs, covering all sides. Allow to sit in the fridge covered in plastic wrap a few hours if you have the time. Heat a few tablespoons of olive oil in a large pan over medium-high heat. Sear the short ribs on all sides until brown. You will want to do this in batches depending on how many ribs you make. When all the ribs have been seared, place them into the bottom of your slow cooker. Drain off all oil in pan, except for around 2 or 3 tablespoons. Add onion and celery to the pan and sauté until translucent, about 4 to 6 minutes. Add garlic and continue to cook. After a few minutes, add 1 heaping tablespoon tomato paste and cook until the tomato has incorporated into the vegetables. Add the cooked vegetables to the slow cooker with the stock, wine, soy sauce and pomegranate molasses. 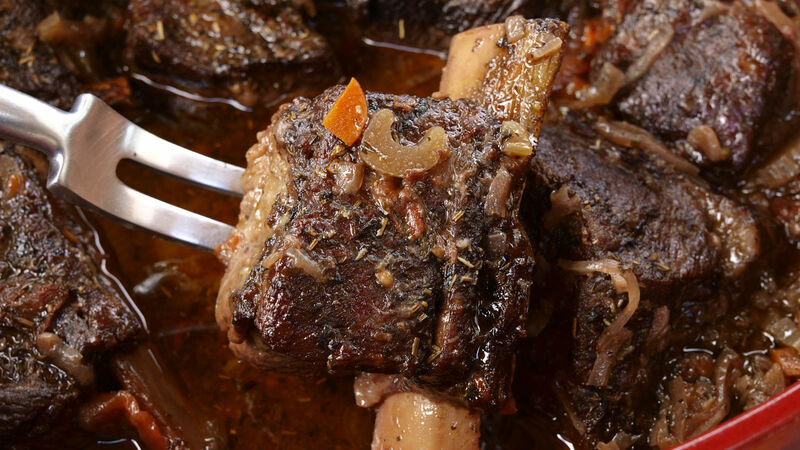 Set your slow cooker for 6 hours on high and allow to cook, ensuring the short ribs are completely covered with liquid. When short ribs are finished cooking, garnish an extra drizzle of pomegranate molasses, fresh chopped parsley and pomegranate seeds, if desired.